At the kind invitation from the Tonoloway Primitive Baptist Cemetery Association, our Choir provided special music and Pastor Terry brought the message at the Annual Memorial Worship Service on Sunday 17 May 2015. Hancock Church’s own, Effie Ward has served for many years as a trustee of the Association. 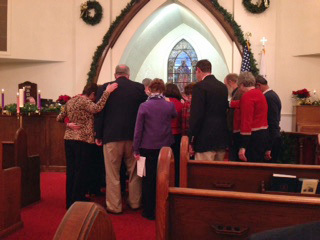 Many thanks to our Choir and friends and members who supported this Service. The Church dates back to 1752 and was an essential hospital during the Civil War. “Surely, the Lord is in this place, this is none other than the house of God…surely, the Lord is in this place and this is the gate of heaven” (Genesis 28:16-17). "A Gift of Love" -- Church World Service (CWS) Blankets + Outreach and Offering was received in February and March. Each $10 donation purchased a blanket for a child or adult in need and added a heart or shamrock message to the Church Bulletin Board. Thank you for all your contributions to this exceptional charity. This is an essential mission helping in emergencies locally and around the world. January 25th, Hayden McCarty and Carl Younker celebrate their January birthdays with cake and candles! On the last Sunday of every month, the congregation celebrates birthdays of all celebrating that month. Elders (both Ruling and Teaching) from Hancock Presbyterian Church, Baltimore Presbytery, and the Hancock Community lay hands on Pastor Terry. 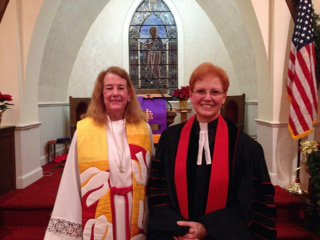 The Reverend Dr. Rene Mackey (left), Moderator of Baltimore Presbytery and Pastor of Covenant Presbyterian Church, Hagerstown, MD, officiated at the Installation Service of Pastor Terry Martin-Minnich (right).